Strength sports have seen a surge in female participation over the last few years, but there's still a strong, and sometimes concerning, emphasis on staying lean while chasing performance. Here are the truths you need to be aware of behind chronic dieting in the pursuit of strength. Like many women, I was drawn to strength sports (powerlifting, in my case) because success had nothing to do with appearance. A big deadlift doesn't require sub 15 percent body fat, right? There's no subjective winning or losing based on the shape of your body, or your conditioning. You either lift more than the person next to you, or you don't. For women who have never viewed fitness this way, it can be radically freeing, empowering, and completely uplifting. When your goals are on the platform, you don't have to obsess over every morsel of food you eat or the number on the scale. You don't have to train to look a certain way. Yet, let's be honest, many women still do. Why? The answer is unique to each woman, but to use social media as a guide, it's clear that many are asking "Why just be strong when I could be jacked, ripped, and strong?" Ah, if only it were that simple. If you're a woman chasing strength goals while also keeping your appearance in the back (or the front) of your mind, here are some hard truths you need to hear. Weight-classed sports like powerlifting, strongman, and Olympic lifting bring with them an inevitable question: Is the weight class I'm in the one where I belong? Or should I step down a class, in the hopes of dominating or setting a record? It's tempting, but IPF powerlifter Kim Walford says you should think twice. Walford has been powerlifting for 18 years and she holds multiple world and multiple national championships. She's also a six-time IPF world champion in the 63-kilogram class, who then gained weight and became the champion in the 72-kilogram weight classes. "Before I made the switch, I felt like the longer I was in the 63-kilogram weight class, the harder it became for me to be able to drop weight as I got stronger and stronger," Walford recalls. "I just got tired of dieting down and realized that I could be just as or even more competitive in my walk-around weight," she explains. Since Walford moved up to the 72-kilogram class, embracing the weight gain has meant not having to worry about making weight for meets. But it also meant feeling better during training and competitions, and being more peace with her body. "It doesn't happen this way for everyone, but I could see just from training during the cycle at body weight what my capabilities were. So, it was easy for me to say, OK, it's time to up my body weight,'" she recalls. "To be successful as a powerlifter, you have to fuel your body to get stronger. There's no way around that." "Jacked and strong" is cool, of course. And when lifters can make it happen, they can get rewarded through things like sponsorships and lots of followers on social media. This can make it hard to imagine softening up. After all, if your abs disappear, your fans and supporters might too, right? On the other hand, Kristin Lander says, being lean has its own unique costs. Lander is an ISSN Sports Nutrition Coach who works primarily with female strength clients. She says many women she has worked with find themselves in a long-running battle against their bodies, and suffer potential consequences in the long run. "Loss of normal hormone function is a big one. That can mean irregular or missing periods, infertility, and also adrenal fatigue. I also find a lot of mild depression or moodiness in women who have been chronically undereating," she says. However, those are just the medical and health consequences. "Plateaus in strength gains is another sign to me that a strength athlete is likely undereating," says Lander. It feels old-fashioned to say it, but it's as true as ever: A man can be big, strong, and carry extra body fat, and still be popular, but it's much harder for a woman to pull off that trifecta. Jordan Feigenbaum, MD, sees it happen every day and is concerned of the implications it has for the growing sport of women's powerlifting. One of his main goals is to get more people involved in barbell training—and these days, that requires him to have a high level of social media engagement. Inevitably, he's noticed how online strength culture affects women's attitudes toward their weight, and not always for the better. "If you're an attractive woman on Instagram, a lot of doors open up to sponsorships and recognition. Your performance often comes secondary to that. Conversely, guys could be a super heavyweight and be super strong and get similar rewards, regardless of looks," says Dr. Feigenbaum. "Because the incentive is different, you end up seeing a lot more women who are reluctant to gain weight and more incentivized to lose weight to fit a certain mold." This doesn't mean you should unfollow all the strong and lean fitstagram faves, necessarily. But like everything on social media, be very careful of the risks of following their example. 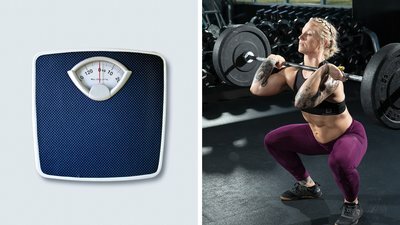 Studies have shown that athletes who compete in what are known as "leanness sports" score significantly higher on a scale of body dissatisfaction than those who participate in non-leanness sports. You may think of gymnastics or bikini competitions as "leanness" sports, but guess what: All weight-classed strength sports are leanness sports. And these sports also score higher for weight-control behavior—which can spiral into behaviors categorized as sub-clinical eating disorders. Many women with disordered eating pasts have found strength sports to be their athletic salvation—myself included. But if you have a history with disordered eating, or tendencies in that direction now, you need to be extra careful, even in sports like powerlifting. Dr. Feigenbaum recommends that women who have a history of eating disorders should assess their risk profile using a screening tool like this one from the National Eating Disorders Association. And if they find that participating in competitions creates problems for them, they shouldn't hesitate to step away from the strength sport—or at least, not worry about which weight class they fall into. "If someone has a predisposition, that could be exacerbated by organized participation in a sport that rewards your performance in a lighter weight class," says Dr. Feigenbaum. "It's important for strength athletes to know what's going in their body and making sure there's enough total calories and the right amounts of foods. You can do this without being obsessive, but you need to make sure you are mentally healthy first." Legitimately "jacked and strong" athletes definitely do exist. However, what non-elite lifters don't realize is that cutting for a better Wilks score, or a better performance in a lower weight class, usually only comes after they build that solid foundation of strength. Walford advises new lifters to make things simple and compete at whatever weight you walk around at. Why? Because self-confidence needs to be built first in strength sports. That—not setting world records—is what your first few meets are about. "It's about welcoming the idea that it's OK to have muscle and that you will still hold onto the same beautiful, awesome, feminine woman that you are as you continue to get stronger," Walford says. Still, when we make the switch from "casual lifter" to "competitive lifter," each one of us will inevitably evaluate our individual circumstances: Where do I stand on a competitive level? Where is my mental state at around my body, training, and food? Is this my "athletic" weight, or should I aim for a different one? When Dr. Feigenbaum approaches an athlete who wants to do a cut, he addresses these questions head-on. "I want to make sure, even if you desire a body composition change, that you are content with where you're at now," he says. "We can't be thinking 'I'm not a person of value until I am 15 percent body fat and deadlifting 400 pounds at 60 kilograms," he says. "If you're a newer lifter who just started training, I expect you to get stronger as you train. If you also want to lose weight, that's OK, as long as we have enough time that we don't have to take drastic measures." They are in a position to qualify for a national or international level meet or set records at that caliber of lifting. They're not already super lean. If a woman is 19 percent body fat or below, a cut is more likely to backfire on the platform. In both of those cases, the lifter should already be someone with experience and plenty of training under their belt. And the cut, when it happens, is very systematic. "I prefer a very moderate cut of 0.5 pounds per week weight loss in order to preserve as much strength as possible," Lander says. "In my experience, much over 0.75 pounds per week is where we start to see a decline in performance, especially if it's for longer than six weeks. If the meet is 13 weeks away and you have more than 10 pounds to lose, that's probably too much to cut without affecting performance." It's normal for athletes to struggle with the tug of war between aesthetics and gaining strength. If you find yourself there, don't beat yourself up. Instead, be honest. Lander suggests sitting down and writing out your priorities. "Make a list of your strength goals and all the things that are important to you regarding your training and performance—and your appearance, if you wish," she says. "Rank those things in order of most to least important. If you are really close to finally getting that 200-pound squat you've always wanted, but after scrolling through your Instagram feed you suddenly feel like you need to lose 5-10 pounds, check your list. If that squat still ranks higher than your body composition, there's your answer." And if losing that 5-10 pounds or seeing your abs is your highest priority, well, that's an answer, too. But it may mean your PR squat has to wait. As simple as this might sound, for me and many other women, this is one of the hardest things to truly understand. My worth doesn't come from the number on the scale, but it doesn't come from numbers I hit on the platform either. Still, there are few things more rewarding than hitting a PR you never thought you could reach—and even more so when a crowd is watching, and a group of dedicated lifters is there competing alongside you. And in that moment, it's hard to hate the body and mind that accomplished it. It took experiencing that moment for me to realize that it's actually OK—even beneficial—for women to hold more mass on our bodies. Especially for beginning to intermediate strength athletes, there's more to gain by, well, gaining—or at least maintaining—than there is to lose. If you're like me, your numbers on the big lifts will thank you for it. Want to build your foundation of strength and muscle the right way? Try Uplifted: Build Muscle and Strength with Meg Squats, only on Bodybuilding.com All Access. With record-setting powerlifter Meg Squats as your guide, you'll train for strength, add muscle where you need it, and practice the right way to eat for performance! Werner, A., Thiel, A., Schneider, S., Mayer, J., Giel, K. E., & Zipfel, S. (2013). Weight-control behaviour and weight-concerns in young elite athletes–a systematic review. Journal of Eating Disorders,1(1), 18.